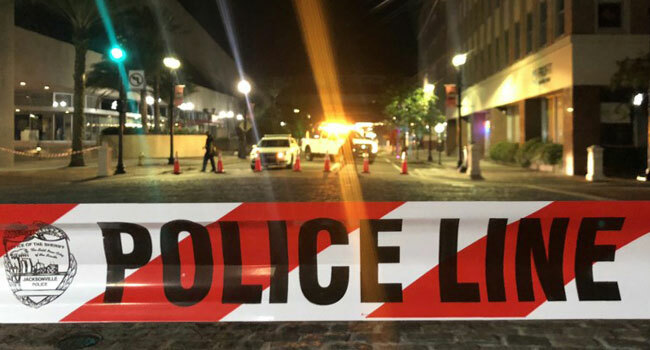 This photo shows a police car behind police tape blocking a street leading to the Jacksonville Landing area in downtown Jacksonville, Florida, August 26, 2018, where three people were killed, including the gunman, and 11 others wounded. On October 1, 2017, a heavily armed “lone wolf” gunman opens fire from a 32-floor hotel room on an open-air concert on the Las Vegas Strip. A 29-year-old gunman opens fire inside a gay nightclub in the Florida city of Orlando on June 12, 2016, and kills 49 people. A former student opens fire at a high school in Parkland, Florida, on February 14, 2018, killing 15 people on the premises with two dying in the hospital. A newlywed radicalized Muslim couple storm a Christmas office party at a social services centre in San Bernardino, California on December 2, 2015, and gun down 14 people, wounding 22 others. They are shot dead by police. A young man wearing body armour storms a cinema showing a late-night premiere of a Batman film in Aurora, Colorado on July 20 2012, opening fire and releasing tear gas. Twelve people are killed and 70 wounded. He is sentenced to life in prison. On March 10, 2009, a heavily armed gunman goes on a shooting spree in three towns in southern Alabama, mowing down 10 people including his mother and grandmother.